Surya's Anjaan, one of the biggies set for release this year, will mostly have its first look released along with Vishal's Naan Sigappu Manithan (which will be out in theaters on April 11th). The film will feature Surya with two distinct looks - one with a stylish beard, trendy hair and the other being a clean shaven look which he is sporting currently. 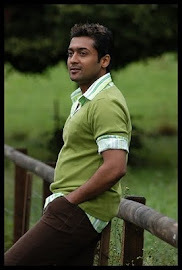 Surya's fans are mighty excited about the movie and are hopeful of another blockbuster after last year's Singam 2.